AAR introduced a lightly modified Eagle for 1974, a further evolution of their 1972 model, but Bobby Unser was finally blessed with reliability to go with the speed and took a deserved championship. Johnny Rutherford was his closest competitor in the works McLaren M16C, itself largely unchanged from 1973. Also very quick in 1974 was the Coyote of AJ Foyt, taking advantage of a new rule that limited manifold pressure to 80 inches for qualifying. The rule was a response to the fuel shortages affecting the US in early 1974 and reduced AAR's order book for the $37,500 1974 model from 23 to 12. As the Ford Quad Cam had never been strong enough to take more than 80 inches anyway, the rule seemed custom-designed for Foyt and his ex-Ford engines. He took pole four times and also won a couple of races in his 1973-spec car. 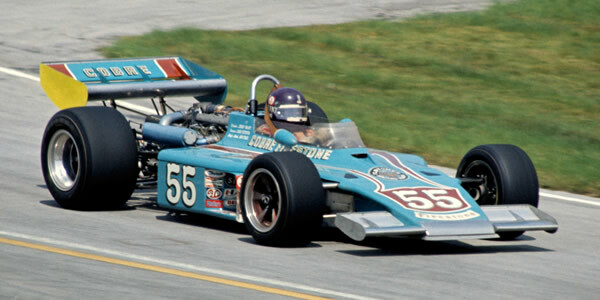 The other competitive teams were Patrick Racing (STP), Parnelli (Viceroy), Jerry O'Connell (Sugaripe Prune) and Bob Fletcher (Cobre Firestone), all equipped with the latest 1974 Eagles. Parnelli also had a new VPJ3 design but abandoned it after a couple of outings. Followers of European racing may be new to two categories of motor racing unique to North America, both of which were used on short track ovals, in events given wonderfully aggrandized names such as the World Series of Auto Racing. In 1974, Midget racers weighed about 1,000 lb and were powered by engines producing 300-400 bhp. Sprint cars were larger, weighing around 1,600 lb, and with about 600 bhp engines. In comparison, F1 cars in 1974 weighed about 1,300 lb and had 460-485 bhp, a F5000 had a little under 500 bhp, a F2 about 280 bhp, and a Formula Atlantic around 200 bhp. However, the US cars used remarkably unsophisticated design, with a single gear, rugged spaceframe chassis, and primitive suspension. USAC mandated good safety standards but away from USAC, on the so-called "outlaw circuit", these were not required.